Ira Udell, MD, is responsible for directing all Department of Ophthalmology activities. A board-certified ophthalmologist, he has served as vice chair of North Shore University Hospital (NSUH) and LIJ Medical Center’s Ophthalmology Department. Dr. Udell joined LIJ Medical Center’s Ophthalmology Department in 1981 as chief of the division of corneal and external diseases. 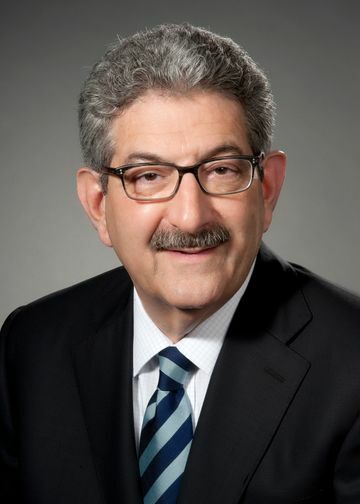 He was named the department’s acting chair in 1993 and appointed permanent chair in 1997, a position he held through 2004 when the ophthalmology departments at NSUH and LIJ were combined. Dr. Udell, chair and professor of ophthalmology at the Zucker School of Medicine, is president and councilor emeritus of the New York State Ophthalmological Society, a former director-at-large of the Contact Lens Association of Ophthalmology and past president of the Long Island Ophthalmologic Society. He received the 2013 Life Achievement Award from the American Academy of Ophthalmology. His research interests include corneal transplantation, DSAEK, ocular infections and ocular surface disorders. Dr. Udell earned his medical degree from Tulane University Medical School and a bachelor's from the University of Pittsburgh. He was a cornea fellow at Massachusetts Eye and Ear Infirmary, Harvard Medical School. View Dr. Udell's clinical profile.